For the second time in two months, a rare deadly sea snake has washed ashore at one of southern California’s most popular beaches. 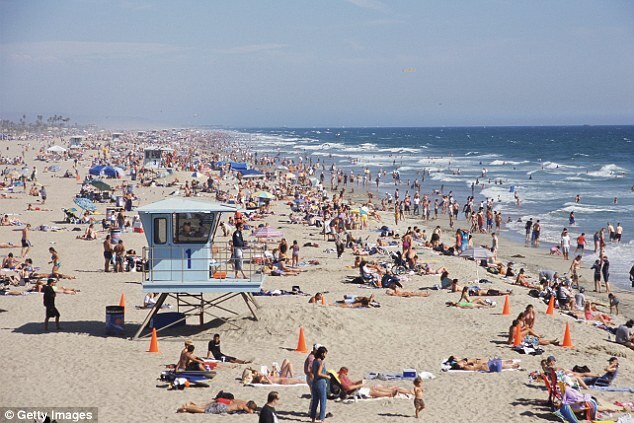 A dead 27-inch-long male yellow bellied sea snake was discovered last week during a coastal cleanup campaign by volunteers for the Surfrider Foundation in Huntington Beach, the Los Angeles Times reported. 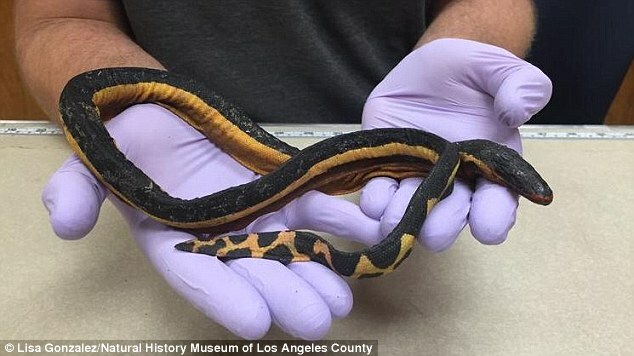 In October, a two-foot-long yellow bellied sea snake was discovered slithering onto Silver Strand State Beach in Ventura County, but it died shortly after being taken to a US Fish and Wildlife Service office nearby. The venomous sea serpent, known to scientists as Pelamis platura, was first spotted in 1972 during an El Niño in San Clemente. A descendant of Australian tiger snakes, experts believe the arrival of the sea snake is a harbinger of El Niño because the last time it appeared in California was during the weather system in the ’80s. According to Arkansas Business, one of the lawsuits against the Swiss seed manufacturer, which has been filed on behalf of two Newport-area farms, alleges that Syngenta “has engaged in a criminal conspiracy to contaminate the U.S. corn crop to force China (and) other nations that buy U.S. corn and U.S. farmers to accept” GMO corn. Farmers in 20 states have filed suit. Together, they represent 86 percent of all corn planted in the United States last year, plaintiffs’ lawyers said. China went on to approve Viptera in December, but plaintiffs’ lawyers say the development has little, if any, effect on their case. Scott Powell of Hare Wynn Newell & Newton of Birmingham, Alabama, is one of those lawyers. China, with its rapidly expanding middle class, has “a voracious appetite for corn,” Powell said, and when it stopped buying U.S. corn, it found other vendors, like Brazil. And once a country finds a substitute vendor for a product, it rarely switches back. It’s not just farmers lining up to sue Syngenta for its shady practice. Other agri-business giants are suing as well. 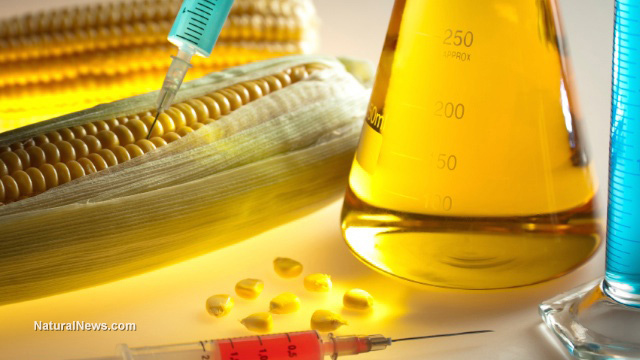 For example ADM, one of the world’s largest processors of corn, filed suit against the Swiss company in November. “Syngenta chose to sell a corn seed product with traits that were not approved in all major export markets, without undertaking reasonable stewardship practices to prevent the resulting crop from commingling with or otherwise tainting the rest of the U.S. corn supply,” an ADM spokeswoman told Arkansas Business. For it’s part, Syngenta says the suits are baseless, saying it “believes that the lawsuits are without merit and strongly upholds the right of growers to have access to approved new technologies that can increase both their productivity and their profitability,” as reported by AgWeb.com. U.S. farmers take China’s business seriously. The annual Geminid meteor shower peaks tonight, Dec. 13-14, as Earth passes through a stream of gravelly debris from “rock comet” 3200 Phaethon. Dark-sky observers in both hemispheres could see as many as 120 meteors per hour during the dark hours between midnight and sunrise on Dec. 14th. Last night, Dec. 12-13, NASA’s all-sky meteor network detected 15 Geminid fireballs over the USA. That number will surely grow on peak night–tonight! Got clouds? Listen for Geminid echoes in the audio feed from our live meteor radar. 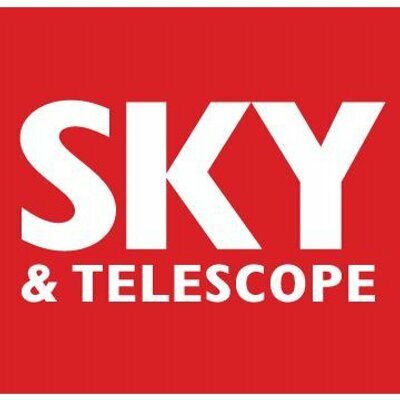 (Sky and Telescope) The nights of December 13-14 offer dark skies for a popular, underappreciated meteor display. 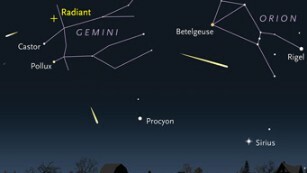 The Geminid meteor shower competes with August’s Perseids for showiness — yet it’s not nearly as well-known. The Geminids are easier on your sleep schedule, too. Their radiant (near Castor in Gemini) climbs as high by 11 p.m. standard time (45 degrees above the local horizon) as the Perseid radiant does by 2 a.m. daylight time on the peak Perseid nights. The higher the radiant, the more meteors you’ll see. The Geminid meteors can flash into view anywhere in the late-night sky when the shower peaks in mid-December. 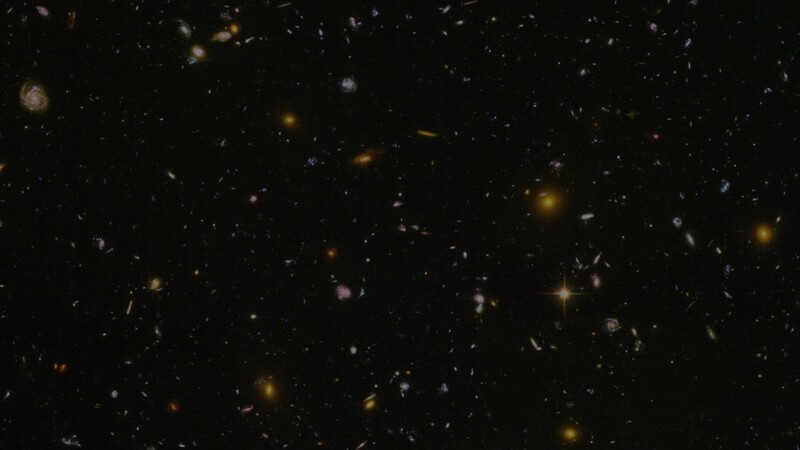 But if you follow their paths back far enough, they all appear to diverge from a point in the constellation Gemini. The International Meteor Organization (IMO) predicts that the Geminids should reach an impressive zenithal hourly rate of 120 this year. (ZHR is how many meteors you’d see see per hour in a very dark sky if the radiant were at the zenith. This year the peak should be centered on roughly 18h Universal Time on December 14. Unfortunately, that’s 1 p.m. EST and 10 a.m. PST. So in North America the shower’s performance is likely to be similar on the nights of December 13-14 and 14-15. As the IMO notes, “Near-peak Geminid rates persist for almost a day, so much of the world has a chance to enjoy something of the shower’s best.” In addition, “mass-sorting within the stream means fainter telescopic meteors should be most abundant almost a day ahead of the visual maximum,” and the meteors after maximum are typically brighter than average. The moon will be a waxing crescent a few days old, no trouble at all. 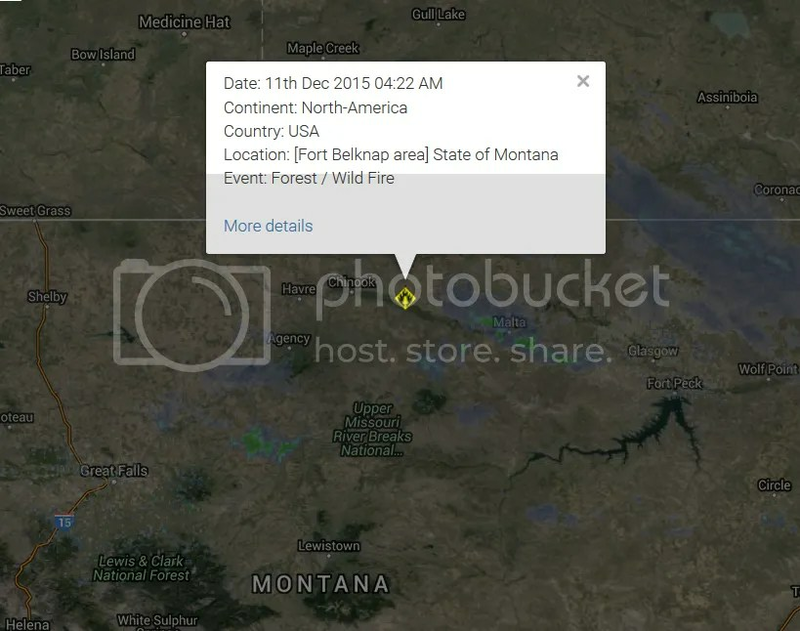 Forest / Wild Fire in United States of America on December 11 2015 04:22 AM (UTC). A large grass fire is burning several miles east of Fort Belknap. There are no reports of injuries at this time; the cause of the fire is not yet known. Randy Perez tells us that the fire is heading toward Pony Hill Cemetery, and is south of Savoy Road. Perez, who lives very close to where the fire is burning, says that it is burning in mostly grass-land, with some alfalfa. He tells us that the wind pushed the fire toward Savoy Road, and the fire then changed direction. Hundreds of tons of hay have burned; at this point, no livestock are believed to have perished. The fire is believed to be about nine miles long, and more than a mile wide. Perez says that ranches have moved two herd of cattle and 100 bulls from the area to escape the approaching flames. At least ten fire trucks are at the scene, with crews responding from the MT Department of Natural Resources and Conservation, Harlem, Turner, Chinook, Dodson, Malta, and Fort Belknap. Authorities estimate that the fire has burned about 5,000 acres. Unseasonably dry and warm fall weather has allowed the lightning-caused fires in the Goat Rock complex and Marston Fire to continue to burn and send smoke to the Flathead Valley.The fires in the Goat Rock complex have burned more than 22,000 acres and are located in and around the Cabinet Mountains Wilderness and Scotchman Peaks area. The Marston Fire has burned over 7,000 acres north of Trego. While some of the fires are continuing to grow slowly, the majority of the burning is in the interior with pockets of fuel burning within the perimeter of the fires, fire managers say. These fires will continue to burn and put up smoke until the area receives significant rain and or snow.